Being vegetarian in Budapest just needed a little planning. It was a pleasure to experience popular local dishes adapted to vegetarian tastes and also cuisines from around the world peppered with Hungarian flavours. This is my second post in the Being vegetarian series. Last month we went to Budapest for a weekend. There is just so much to see and experience that really 2 days weren’t enough. And such was also my experience of vegetarian food in Budapest. Hungarian Cuisine is largely non-vegetarian but Budapest being the capital and a very cosmopolitan city has embraced multiple cuisines. I was amazed to see vegan options clearly listed out in most menus. 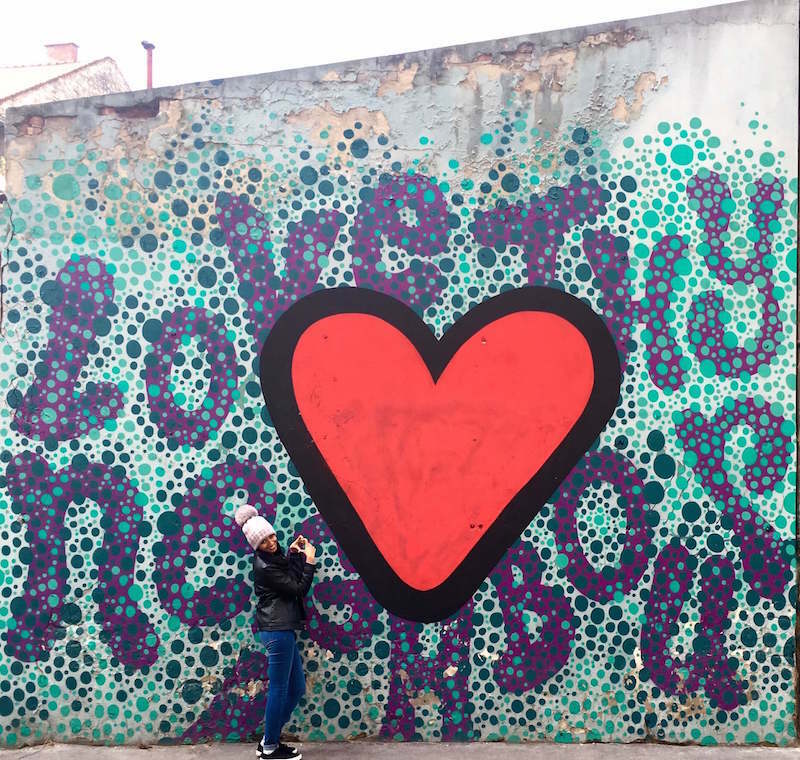 Loved the street art all around the Jewish quarter, along with the food! 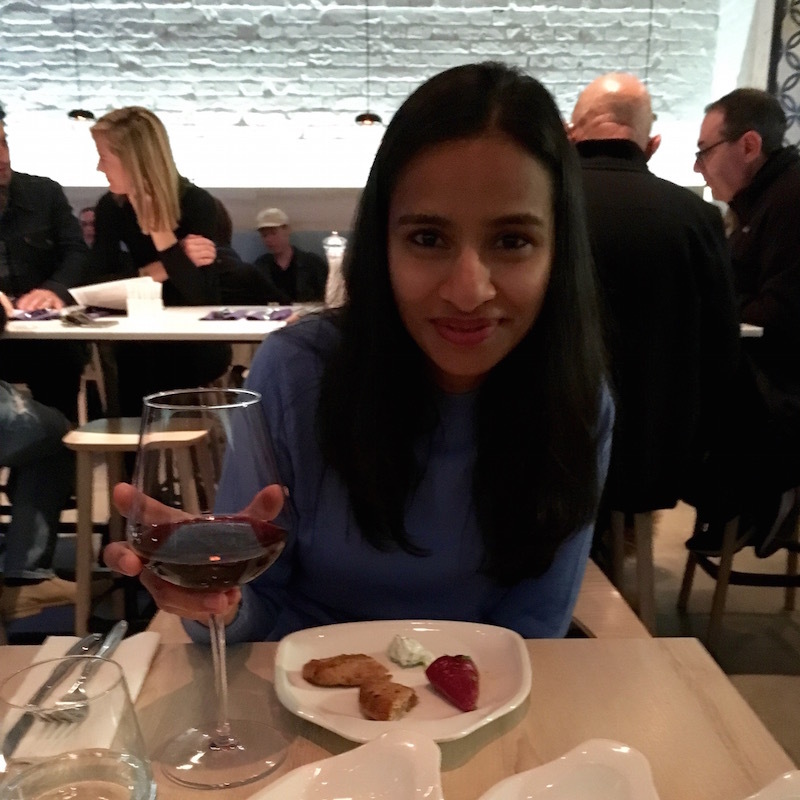 Here are some of the restaurants we went to and would highly recommend especially if you are looking for vegetarian or vegan and even gluten-free food in Budapest. shakshuka, labneh, sabbich etc but the chef had an interesting fusion menu. 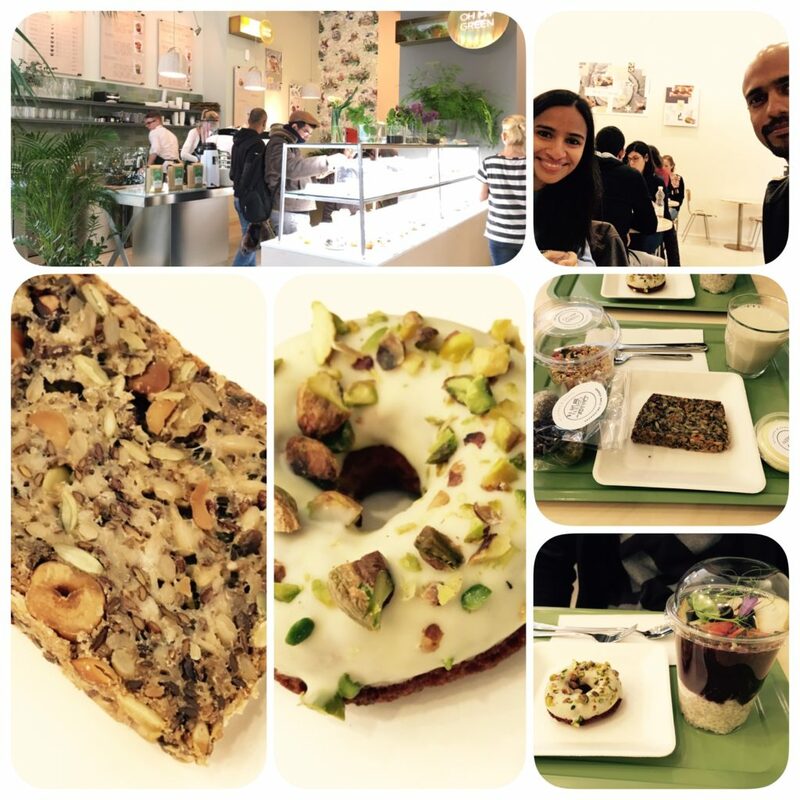 I specially recommend the pistachio soup and the ‘sweet potato bun’ falafel burger. I was surprised when the bun was actually two thick slices of sweet potato! This one was a delightful discovery. Read about them as one of the ‘new restaurants on the block’ in a Budapest weekly magazine. They have amazing gluten-free and vegan items on their menu. 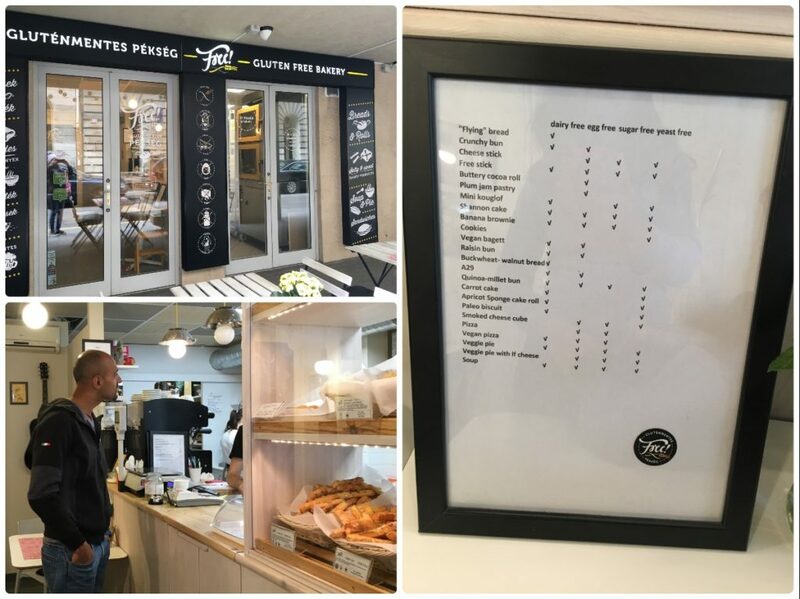 We were there for breakfast and loved their smoothie, granola, gluten-free seeds bread and the gluten-free donut was a real treat! A Hungarian cuisine restaurant which was recommended as vegetarian friendly. It is a delightful little restaurant serving traditional dishes, exactly the way they are supposed to be. I loved the Lángos – fried cheese and dough dumplings! Also the mushroom paprikash, which is like a mushroom curry with their traditional dumpling pasta, was nice. The pasta takes some getting used to. It was very dough-ey for me. 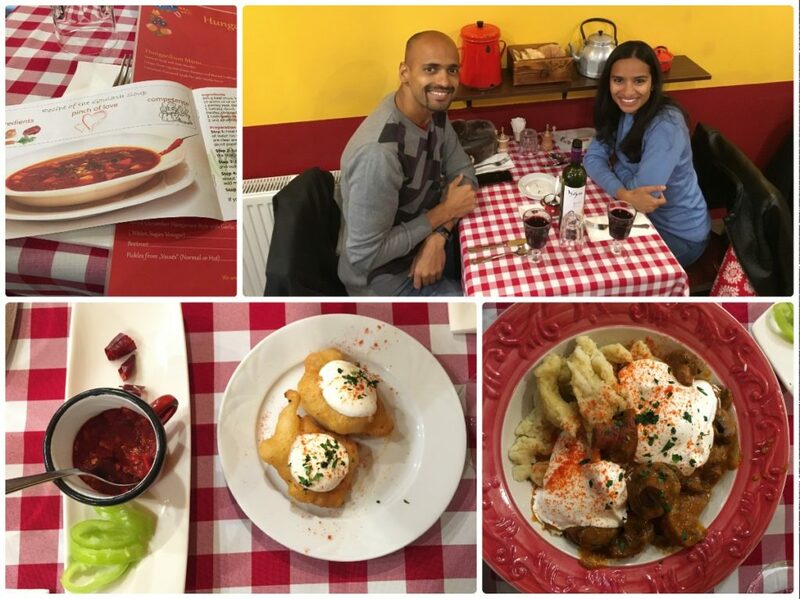 Vegetarian choices are limited in traditional Hungarian cuisine but we had to try local flavours. they also give a little booklet to take home with the recipe of the traditional Goulash soup! Free is a gluten-free bakery for some guilt-“free”-sweet cravings and coffee. I loved the name. It has products that fall under all “xyz-free” category. Gluten-free, dairy-free, soy-free, egg-free… you name it, they have it. It is a small family run bakery started by a couple when their daughter had wheat allergies. 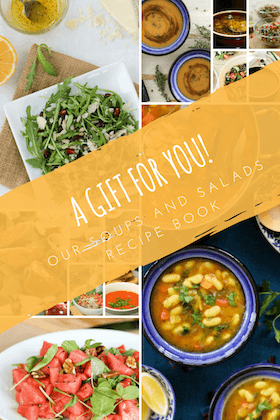 Over time they had developed many gluten-free recipes and felt they had to share the goodness with all. We loved their gluten-free ‘flying bread’ and even brought back some with us to Bucharest! This wine bar was highly highly recommended by our host and rightly so. The staff is super helpful and beside the unending list of local wines that they have, the food is also very nice. They have vegetarian tapas, salads and sandwiches and while I had a salad with both cheese and bread one can easily have vegan and gluten-free meals here. Again a great recommendation. 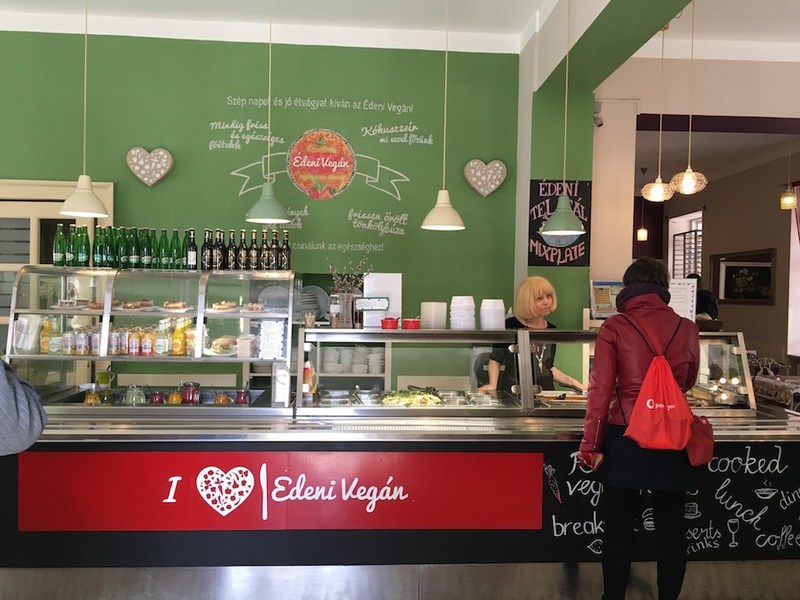 Edeni Vegan is a small buffet style restaurant serving traditional Hungarian dishes adapted to vegan cooking. They had the Goulash soup with soy nuggets. Even though the menu is fixed they have plenty of raw and cooked vegan meals. From outside it looks like a very small place and if we hadn’t been told about this, we might not have stepped in. But inside it is a wide open space. We came here on our last night and it was a fitting farewell meal. They have lots of vegetarian dishes on menu. We loved everything that we ordered — the pita, the tzatziki, the pepper, the burger and the village style pasta with tons of veggies! Every restaurant we went to, the staff was very friendly and always ready to help with suggestions. One important point, it is best to book in advance at most restaurants. We were lucky with Mazel Tov, we only had to wait for 10 mins but after the first night, we made reservations at all restaurants. 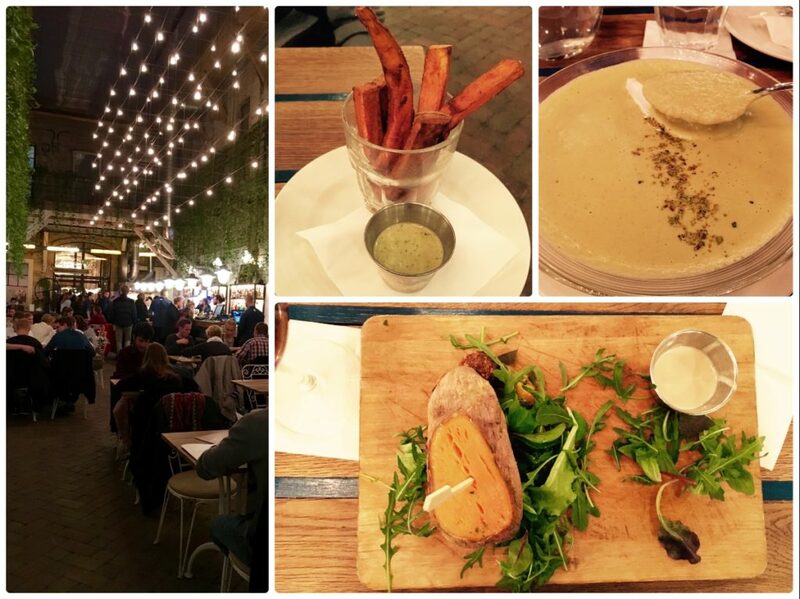 Apart from restaurants, Vörösmarty square is a great place for some street food. It might not be the place for main meals for vegetarians but it is a great place for in-between snacks and coffee. Gozsdu Udvar, a corridor between many apartment buildings is a late night eating joint with many restraints, pubs and take-away places. We had some 2am veg stir-fried noodles here after one crazy ruin bar hopping night. For a souvenir, I would definitely recommend getting home a packet of their sweet and aromatic paprika. Love it. If you have been to any of these places, I would love to talk about your experience. And it would also be great if you would like to share your experience of another restaurant you had nice vegetarian meal at. Wish you a happy vegetarian meal in Budapest! I cannot thank you enough for this webpage and your suggestions. You are making planning our trip to Budapest so much easier! As a vegetarian leaning vegan, visiting countries that don’t embrace my food preferences can be difficult. Your suggestions, photos and links to the websites will help ensure a great experience. I am so happy to read this! Your message really encourages me to keep on documenting my food experiences during our travels. I haven’t been doing that lately 😮 I am so glad you found it helpful. In case you need any help with preparation, feel free to send me a message!